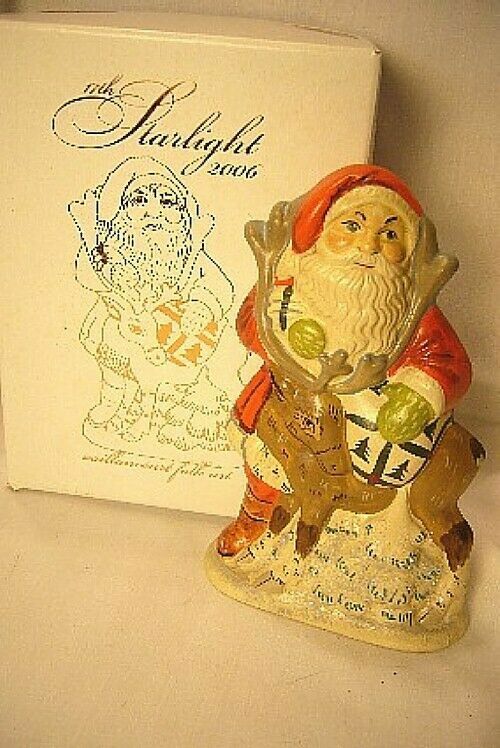 Vaillancourt Folk Art , 17th Starlight Santa, No. 2006 - 30 - 2006 - # 459. Another Wonderful Santa produced in co-operation with the Starlight Foundation each year. A limited production piece that is produced until the end of the year, December 31st, 2006. It has another first though as being the first produced at Vaillancourt Folk Art's new home of Manchaug Mills in Sutton, Mass. This piece is beautifully painted with a added touch of Mica in the snow. It measures 6 1/4 inches and is from a JKV mould from Holland. It is in perfect condition and comes in a nice gift box. And Personally signed by Judy Vaillancourt the artist.